6-1/185 senior Mater Dei kicker Nick Lopez became the latest in a growing line of Mater Dei Monarchs to trade in the red and white of Mater Dei for the blue and gold of Cal, committing to play for the Bears in 2019. Lopez is following a large group of Mater Dei players to play for Cal in recent years, including graduating seniors Malik McMorris, Chase Forrest, Matt Rockett and Addison Ooms, in addition to frosh receiver Nikko Remigio and redshirt senior running back Justin Norbeck. Though Lopez has a big leg on the gridiron, it wasn’t too long ago that he thought soccer might be his best path to athletic success at the collegiate level. 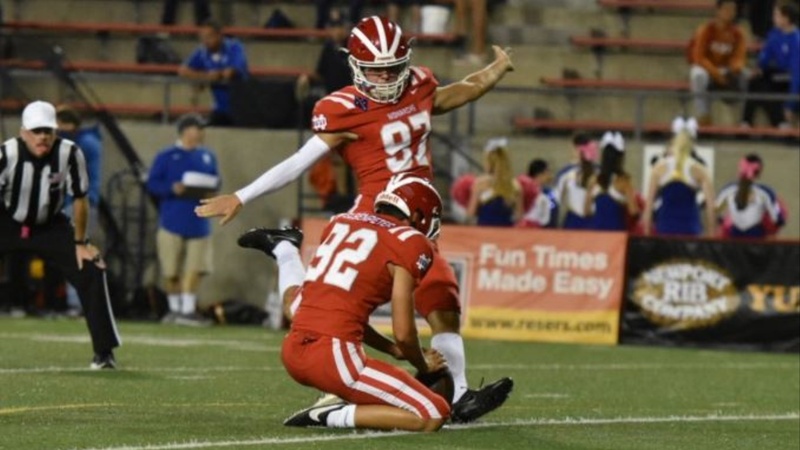 A kicker for a prolific program like Mater Dei always has to keep his leg warm for plenty of kickoffs but the flip side was that the Monarchs rarely attempted field goals with so many touchdowns scored. The senior kicker went three-for-six from mostly long distance and 77-for-80 on PAT’s. He also regularly booted touchbacks on his many kickoffs. Turns out Lopez isn’t the only offspring with a big leg in the family, too. With signing day looming next Wednesday, Lopez, who sports a tremendous 4.5 gpa, is anxious to move on to the next phase of his life. “To be honest with you, playing at Cal was my dream once I knew that kicking was going to be my skill. I’m just very grateful that it worked out how I wished it,” concluded Lopez.